What happens when the person you are turns out not to be the person you want to be – or the person you feel you should be? The three new plays premiering as part of this year’s relocated HighTide Festival all grapple with versions of this same question. Desire, identity and ambition are recurring themes, as is the very idea of performance: the selves we perform for others, and what might lie beneath. The shingle and seagull cries of HighTide’s new home in Aldeburgh are an apt backdrop for Luke Norris’s latest play So Here We Are, a portrait of grief and disappointment beneath the slate skies and glaring coloured bulbs of Southend. 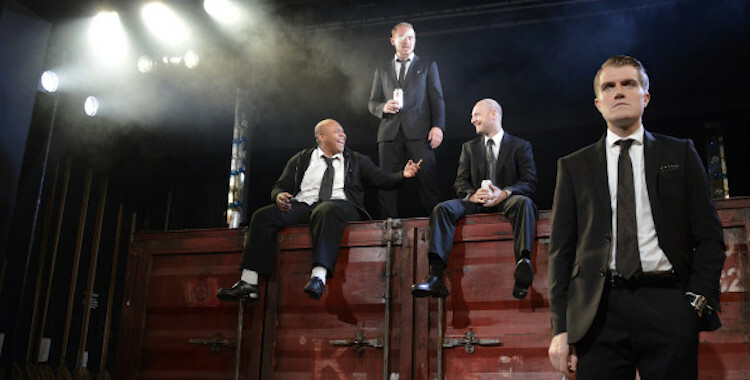 Steven Atkinson’s production opens with four men staring out at the audience, cans of Stella in hand, their long silence as hard-edged as Lily Arnold’s pointedly masculine design of concrete and shipping containers. They don’t know what to say. They’re mourning the death of Frankie, childhood friend and missing member of their five-a-side team. When they do find words, they talk awkwardly around the gaping black hole of their grief, gags and insults thrown around as aggressive tokens of affection. Norris’s dialogue is brilliant at capturing the everyday rhythms and evasions of speech, particularly between men who would rather crack jokes than confront their emotions. “People need a laugh,” reasons laddish Pidge, but not all of his mates agree. Then there’s a question, tentatively aired, about the nature of Frankie’s death. Was it really an accident? In the second half, flashing back to the last hours of Frankie’s life, the clues and doubts planted in the first begin to take seed. We see Frankie stuck, restricted to a path he never meant to set out on. “What’s the point?” he asks. There’s no answer. It’s a very ordinary tragedy, of a life confined by wrong decisions and the inflexible expectations of what makes up a “normal” life: wife, mortgage, kids. As the future ghosts the present, watching becomes an exercise in connecting dots. The picture that emerges, though, is disappointingly neat, going needlessly far in its explanations and losing some of the simple impact of the first act. Resolution blunts loss and rage. Up the road and away from the beach, the eponymous protagonist of BRENDA is also questioning the point of it all. Created by writer E V Crowe and director Caitlin McLeod, this is a real curiosity of a show, as frustrating as it is intriguing. Cannily staged in a local church hall, the piece finds down on their luck couple Brenda (Alison O’Donnell) and Robert (Jack Tarlton) about to make a plea to their community for help. Only before she can introduce herself to others, Brenda needs convincing that she’s even a person at all. It’s a strange, offbeat watch. Crowe and McLeod stretch insistently at pauses, testing how long it’s possible to stage silent entrances, exits and absences. As they haphazardly rehearse their presentation, O’Donnell and Tarlton move among the audience, talking repeatedly about community while very deliberately ignoring the community of spectators right there in front of them. The fourth wall isn’t exactly broken, but these theatre-makers know how to prod it. Theatricality and the art of performance are central and persistent concerns. But it’s never quite clear to what ends. With her repeated, insistent statement “I’m not a person”, Brenda’s unnervingly extreme position hints at the rather more ordinary ways in which we all perform coherent selves. There are also distant echoes of government and media rhetoric, insidiously undermining the personhood of those who don’t fit into the “aspiration nation”, but this is never more than a faint resonance. The disturbing final moments suggest something dark yet undiagnosed underneath the play’s slippery surface; what it might be is anyone’s guess. Even more unsettling than the closing image of BRENDA is the final and most impressive premiere of the festival, Al Smith’s haunting Harrogate. As staged by Richard Twyman, it’s nightmarishly uncanny, its triptych of scenes worming their way further and further into the mind and remaining there in a stubborn tangle. It’s a play of jolts, each the theatrical equivalent of that feeling of missing a step in the moments between waking and sleeping. A scenario suddenly flips, leaving us queasily reeling. Put simply, Harrogate is an exploration of a father’s uneasy infatuation with his teenage daughter, but with none of the sensation you might expect. Nick Sidi as the middle-aged man struggling with his daughter’s nascent sexuality is a complex and conflicted character, torn agonisingly between nostalgia and desire. He longs for the partner he once had in his youth, rather than the spouse he now shares his life with, while beginning to see the child they have created together from a new and disturbing perspective. The excellent Sarah Ridgeway is wife, daughter and fantasy – sometimes in separate scenes, sometimes not. In each of the play’s three sections, she appears in a slightly different guise, but casting, text and staging all encourage slippages. From the moment the show first catches us off balance, we can never be entirely sure what we’re watching, while echoes and repetitions reverberate between scenes. It’s disquieting, but never wilfully taboo-busting – quite a feat, given the subject matter. “What if we’re all paper thin and painted over?” asks the daughter at one point in Harrogate. It’s a description that might fit any of the fragile characters in these three plays, from the men dodging their emotions in So Here We Are to the non-person at the centre of BRENDA. And it’s a fitting coincidence that in the year HighTide reinvents itself, creating a real festival atmosphere as it spreads across the ridiculously picturesque seaside town of Aldeburgh, its programme is also interrogating notions of identity.